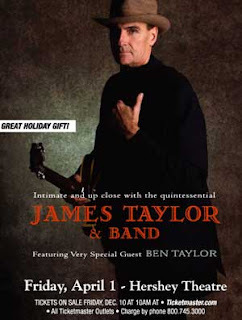 Intimate and up-close with the quintessential James Taylor and Band. Featuring Very Special Guest, Ben Taylor. at Hershey Theatre Box Office, at all Ticketmaster locations, online or by calling Hershey Theatre at 717-534-3405 or Ticketmaster at 1-800-745-3000.